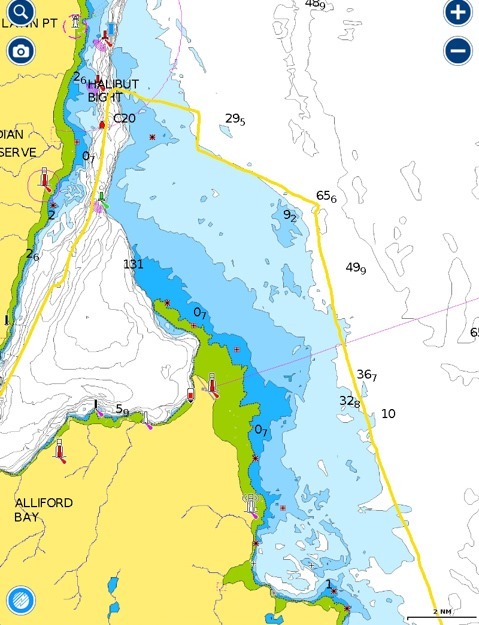 If you’re coming into Skidegate (the main port area of Haida Gwaii) from the south, it’s a surprisingly long day – 55 nautical miles if you take the most conservative route around the Sandspit sand bar. That’s almost as long as crossing Hecate Strait! The reason for this deceptively long day is the Sandspit bar extends about 6 miles north. To avoid going over the shallow bar you go 6 miles north and then 6 miles back south, nearly to where you started 2 hours ago but about 2 miles west of that. The Sandspit bar (part of it). So the temptation to cut the bar (cross it earlier) is strong. And many boats do that, particularly shallow draft motorboats or local boats with local knowledge of the bar. We decided to shortcut it a bit – at the C18 buoy where we’d have 30 foot depth on high tide – but not as much as we could’ve. 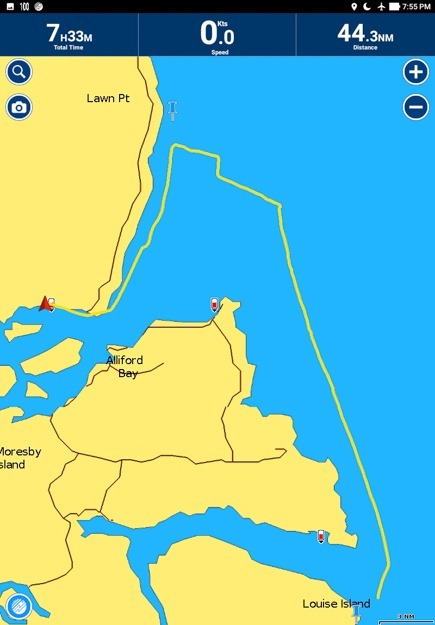 This cut our trip to about 47 nm overall. The other tricky part about the bar is it has strong tides which can kick up short, steep seas. Departing Skedans we were overjoyed to find 8-12 kts of SE wind had come up (we thought we’d have to motor all 47 miles), allowing us to fly the spinnaker for the first time this year. Of course, we didn’t take it down promptly enough when the wind rose to 16-20, and had a scary / unhappy moment as the spinnaker base dragged in the water. 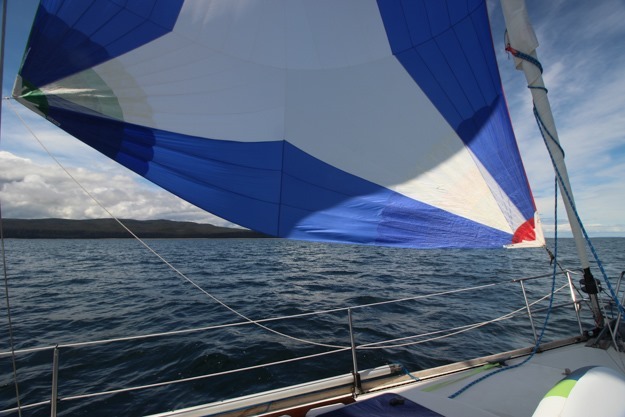 Even a smallish spinnaker water anchor (a twist creating a balloon of fabric acting as a water scoop) is very hard to get back on the boat! As we approached the bar in 18-20 kts of wind on a flood tide (northbound) but changing to ebb, the waves built to short-interval 3 foot chop and white-cap crested rollers. The waves were bad before and over the bar, and surprisingly they remained bad even in the deepwater channel after the bar. In that narrow channel we motored upwind with a reefed main for stabilization, and took plenty of wave spray over the bow. Sheets of salt water blanketed the dodger windows. If that’s what the Sandspit bar is like in 20 kts, we definitely don’t want to be out in more. 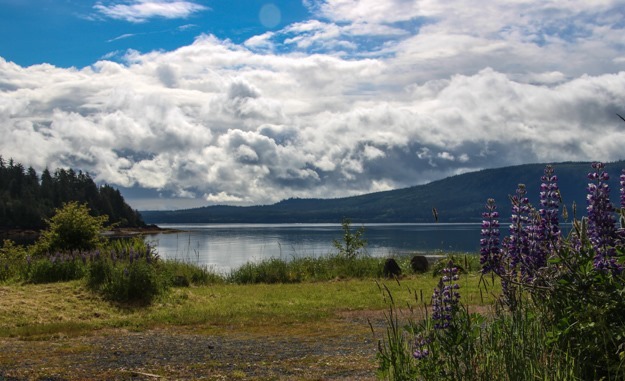 We spent 7 days in Skidegate Inlet. This is the longest we’ve stayed in one place, but there were a few reasons for it. We needed some civilization time, having been off the grid away from people and Internet for a while (with a number of chores to catch up on). 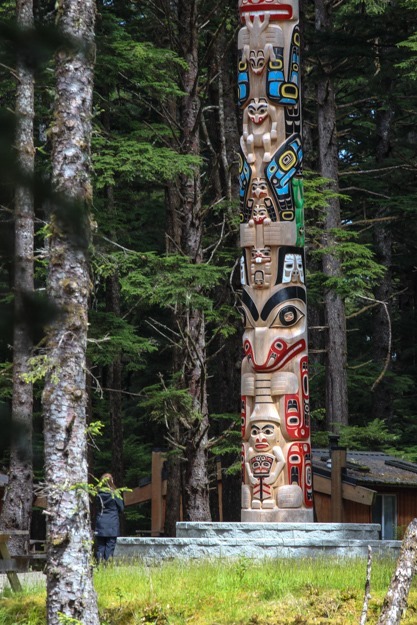 And there’s a bunch of stuff we wanted to do from here: reprovisioning, visiting the Haida heritage center, and renting a car to visit the northern island of Haida Gwaii. Queen Charlotte City (I call it Q City for short) and Sandspit have the two marinas available in the inlet. 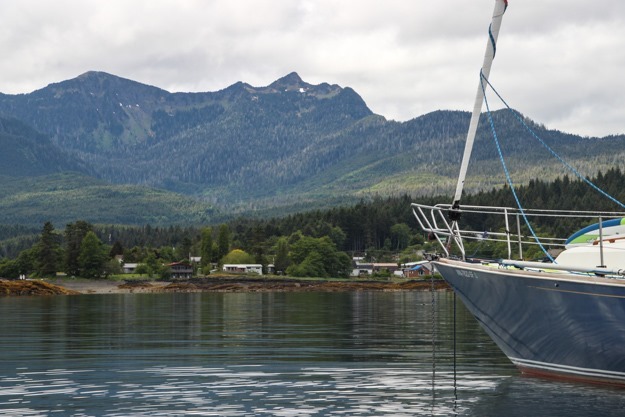 We anchored off the Queen Charlotte marina – partly because Sandspit doesn’t have a good anchorage, and partly because Q City provides easier access to the north island of Haida Gwaii (Moresby) where we wanted to do some exploration with a rental car. The Queen Charlotte dock is a public dock, which in BC means a small marina that is usually 95% full with boats that rarely go anywhere. There were only 1 or 2 spots available to visiting boats, and those were full. We kept an eye out to see if a spot would free up the next day. There are few amenities at the public dock (no bathrooms, showers, or laundry) so eventually we decided we had no need to go there, and decided to go to Sandspit marina on the way out instead. Now that we’re in remote areas and going 1-2 weeks between ports, we always have a few important priorities to find in a port: groceries, laundry, and a coffee shop with good wifi (for updating our charts and downloading our favorite TV shows – S/V Delos, John Oliver, Handmaid’s Tale, Black Sails, etc). Groceries: The Masset Co-Op is the best, but it’s a long drive. The Skidegate Co-Op isn’t as good but probably is the next best. Next, the Organics store in Q City is awesome, but pricey. Lastly, the Queen Charlotte City Center grocery store next to the post office and liquor store is pretty glum looking, but probably has the cheapest prices on boxed goods. Their fresh goods though are hit-or-miss (the onions looked like they were already rotting on the shelves). Laundry: There’s laundry in Q City next to the grocery store, but it’s pretty sketch. A dimly lit room with no signage out front, and 3 of 4 dryers out of order. We used the laundry in Sandspit at the RV park down the street from the marina (which unfortunately wasn’t much better – just one washer/dryer). Coffee Shop: Queen B’s in Q City is decent, but the wifi was unusable for more than email (so not useful because our phones can already do that). 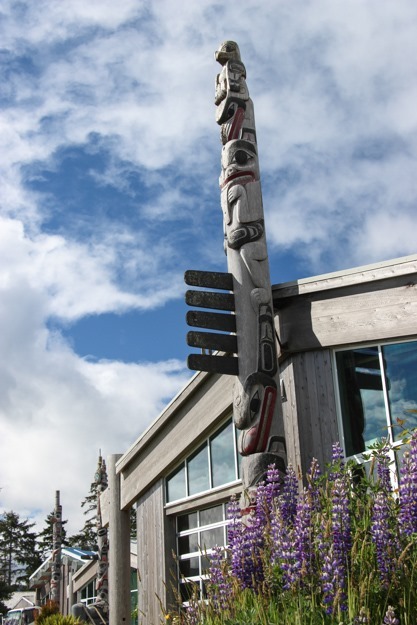 Jag’s coffee house in Skidegate requires a drive, but had the best coffee, excellent food, and fast wifi! 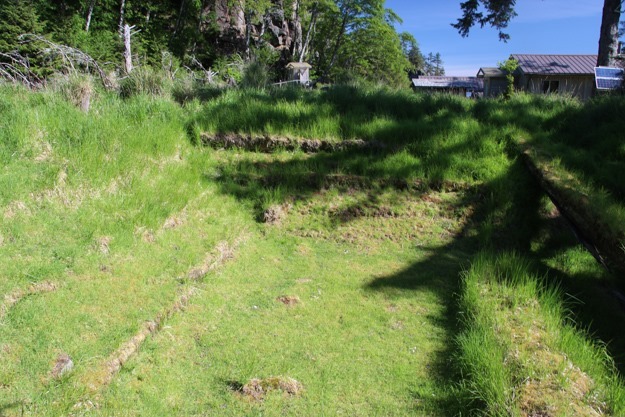 As we found out on our roadtrip, Haida Gwaii has many microclimates. As we drove north, we went through lots of different weather – sun, clouds, wind, a graupel storm and rain storms. Partly this is due to the unsettled weather in early June this year. 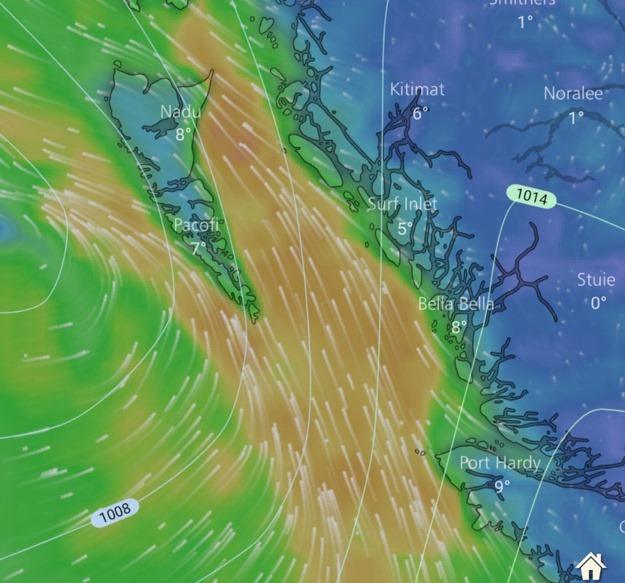 Southerly fronts are blowing through and interact with the mountains on Haida Gwaii. The weather has been starting to wear us out and demoralize both of us. Although the sun comes out periodically, we’ve had rainy weather for 2 weeks now, and southerly gales every 3-4 days. It’s also only about 52 degrees Fahrenheit in the daytime. Sometimes the rain is quite hard, pelting the boat and preventing us from doing much at all. It’s harder to get chores done (like laundry, which we had to walk a mile to get to in rain and gale-force winds!) 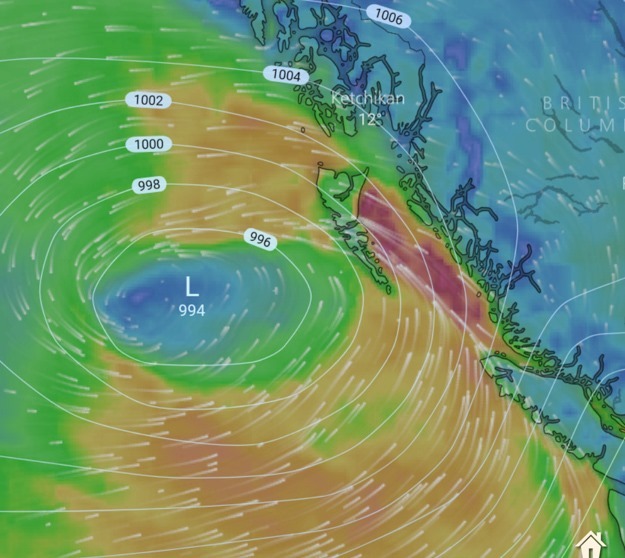 and since Haida Gwaii is a very remote, sparsely populated place, there’s not much to do when the weather is bad. We’re probably here a bit too early – there’s a reason June is considered early season for tourists, and that’s that summer conditions aren’t assured until July. So we’re trying to wait out the weather now, hoping for better sailing conditions soon. Lifting our spirits is knowing that the more we wait, the more likely it is to get better. For the last 3 days of our week in Skidegate Inlet, we relocated to Sandspit marina about 9 miles east of Queen Charlotte City. We needed some marina time to dry out the boat (it’d been 1 1/2 weeks since our last marina, and it’s been raining a lot! ), and needed to do laundry and maybe have a hot shower. Also, a 40-45 knot gale was coming and we wouldn’t want to be in the Q City anchorage which is poorly protected from south-easterlies. Pros: Better marina with more modern docks and plenty of slips / dock space available. Has showers and laundry available. Friendly and helpful marina manager who returns phone calls promptly. Better fuel dock. Very good moorage rates (about 1/2 that of Q City public dock). Cons: Showers and laundry are at the RV / tent park 10 minutes down the road, and the laundry only has a single washer and dryer. Sandspit doesn’t really have a town or much to do, and it’s a 2+ mile walk to the grocery. The marina receives a lot of wind in a south-easterly and wave fetch builds up within the marina fairway to the outside of D dock, making our boat fairly rocky in the 30 kt gusts. This is the 40 knot gale that blew through June 5. At the peak, waves in South Hecate Strait reached 15 feet! Keep in mind that’s not gentle ocean swell, that’s pretty much 15 feet of short interval misery. 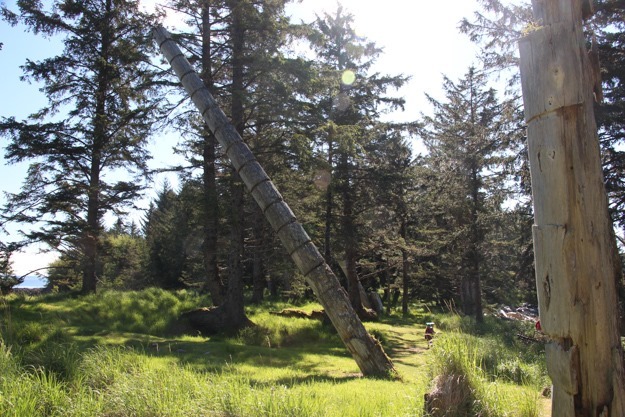 Next we’re heading south down the east side of Haida Gwaii, to visit the remote and beautiful Gwaii Haanas park.